ANZAC Day is a national remembrance day in Australia and is celebrated annually on April 25th, to remember members of the Australian and New Zealand Army Corps who fought bravely at Gallipoli, Turkey during the First World War. ANZAC Day also commemorates all those who made the ultimate sacrifice and served in military operations for Australia. 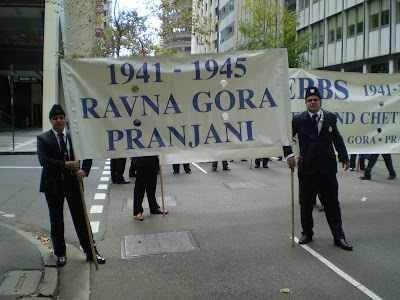 The Serbian Community in Sydney, Australia has attended and made a strong presence in the national ANZAC Day commemoration services since 1956 by attending the Sydney March. 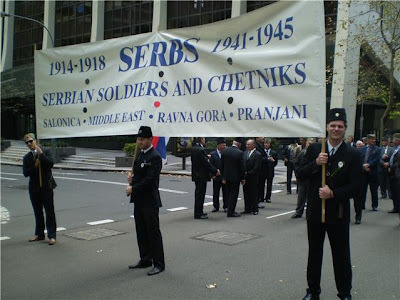 Throughout all capital cities within Australia, grand children and great grandchildren of Serbian Chetnik soldiers along with Serbian Chetnik WW2 veterans have marched alongside one another to remember the fallen Serbian and Australian Soldier. This year’s ANZAC Day commemoration witnessed the next generation of young Australians of Serbian heritage showing their ultimate respect for the legacy of the fallen Australian and Serbian soldiers who gave their lives during the First and Second World Wars. Members of the Serbian contingent attended the traditional ANZAC Day Dawn services hosted at local venues. These services are described as being phenomenal, spiritual and divine. The Dawn service always witnesses a large number of locals. The young contingent of Australians of Serbian heritage paid their respects to all those who made the ultimate sacrifice to defend today’s freedom and democracy. 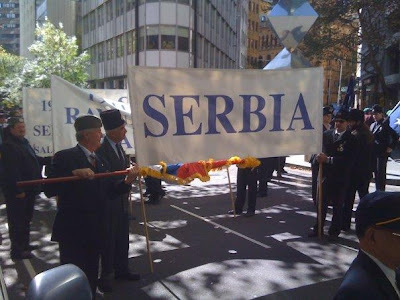 Members then proceeded to the Sydney Central Building District to represent our fallen Serbian fathers, grandfathers, and great grandfathers who fought in the Allied war effort in both World Wars. The ANZAC parade itself is always inspirational and full of mixed emotions. Remembering the fallen and being reminded of their sacrifices and ordeals is always difficult. On the other hand, we were given the opportunity to have discussions with WW2 Serbian Chetnik veterans who have the greatest war stories. These stories could not be obtained from reading any written material. The families who attended the ANZAC Day march should be commended - as we should all take time out of our busy life styles to remember those who made the ultimate sacrifice. I know that the Australian Serbian contingent is extremely proud of their family members who fought side by side with General Dragoljub Mihailovich and who took part in the largest allied rescue mission from behind enemy lines during the Second World War. We will continue to honour their memory. Our forefathers would be proud of the young Serbian men marching today as their legacy continues to live on. As a contingent, we are also proud to be Australians and to have the honour to remember, too, the fallen Australian soldier and the spirit of the ANZAC. 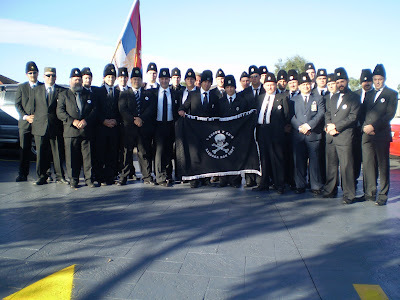 Following the march, the contingent moved onto the Serbian Chetnik Club at Bonnyrigg in Sydney, where a lunch was hosted. A wreath was placed alongside the statue of our WW2 Commander General Dragoljub Mihailovich and prayers were said by the contingent to remember the Australian and Serbian Chetnik soldiers who died for freedom and liberty. Dr. Milan Brkljac was the main organizer for the young Serbian intellectuals marching in remembrance of their Serbian forefathers. Almost 50 Lawyers, Doctors, Engineers, Scientist, Accountants, respected businessman and the likes marched with pride and passion. These young intellectuals were dressed in black suits and black subare. Dr. Brkljac was overwhelmed with the professionalism these young men demonstrated during and after the march. 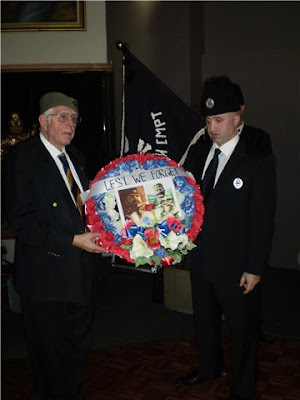 He began preparing for this ANZAC Day celebration six months in advance and without his time, effort and determination, the Serbian contribution could not have taken place. 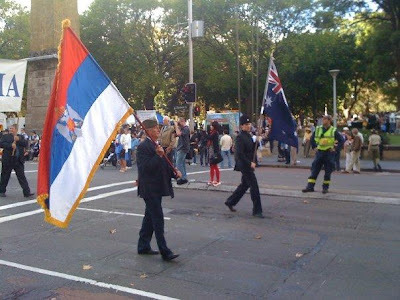 Australia and Serbia have something in common: both Australian and Serbian soldiers fought against all odds to protect their nation’s national identity. The Serbs, during World War One, lost 1 in 3 men participating in the Allied war effort, and this generation of Australians will continue to take part in future ANZAC services to remember all the fallen Australian and Serbian soldiers of that Great War and the Second World War that followed, and to honor them.